Once again I am talking about camping. this time I'm talking about camping with kids. Kids make camping even more fun as they learn to appreciate nature and all it has to offer. Kids love to be included in any adventure you are going to take. Let them help in the preparations of the trip. They can plan activities and pack the food. 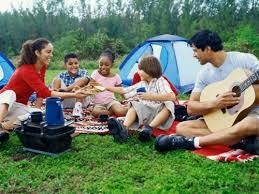 This article with tips for camping with kids will give you some great ideas. When my boys were young we loved to camp and the many activities that come with it. Camping and enjoying nature cam make for many great memories. Even today my boys talk about camping at the lake and all the fun they had. I hope you take the time to camp with your family this summer. Let me know how it goes.. Get out and make some memories.